Did a little shading with Prismacolor pencils. Is that ladybug too cute? There is a set of 3 different sizes, and he is the smallest. Perfect - life size! Who doesn't love ladybugs? I used my glaze pen on him so he's a little bit shiny. Cloud stencil for the sky, and the saying is stamped in Stazon Jet Black, only because I could reach it and it gives such a good crisp image. The 2nd card is a 3" square. That is a fun little size to work with! The main scene was done at the same time as the other one...this card actually intended to look the same as the 1st one, but the sentiment stamped terrible, and crooked too, so I had to improvise, and trim a bit. 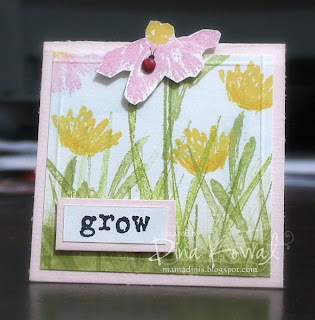 :) The sentiment and the flower are popped using mounting tape. That ladybug is one of my favorite ways to use a brad. Draw the little head and antennae first, then poke that little booger through, draw a couple dots with a permanent pen (oops - this one didn't get any dots!) and you have yourself a cute little ladybug. I needed some pink gingham ribbon, but I don't have any (RAK, anyone?! )...it needs something off to the right from the "grow". Oh, on both the cards I flipped the main panel over and scored 1/8" from the edge. For some reason when I'm not doing a lot of layering that makes up for it. Maybe it's just me. That is a new watermark too - I haven't had a chance to post it yet, but it is available. I like the delicate, subtle flourish. That would be #20 if you want to request it. $3.00! How can you resist? Cute cards...my fav is the first one! Those cards are truly pieces of art. Very beautiful. 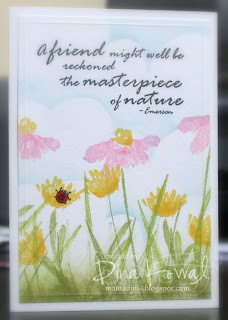 Love the spring cards, Dina.